Obama tells audience to remember the "fierce urgency of right now"
WASHINGTON (CNN) -- After a heady week on a high-stakes world stage, President Obama returned to America's messiest political mosh pit -- the health care debate. 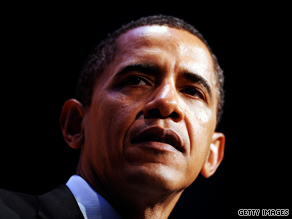 President Obama says the time for health care reform is now. Speaking before the Congressional Black Caucus Foundation's annual dinner on Saturday night, Obama prescribed the same contentious policy pill he's embraced since taking office: health care reform and his intention to "get it done this year." "We must bring about a better health care system in this country not in ten years, not in five years, not in one year, this year," he said. Taking on the voices that say the administration is moving too fast on health care and needs to slow down, he cited examples of people who need urgent health care, and said such people can't be asked to wait. In recent days, Obama appeared before the U.N. General Assembly and the Group of 20 summit in Pittsburgh, during a week punctuated by a dramatic condemnation at the G-20 by Obama, British Prime Minister Gordon Brown, and French President Nicolas Sarkozy of Iran for secretly developing a second uranium enrichment facility. But health care came up there at the G-20, too, Obama recounted Saturday night. He mentioned a conversation with an unnamed foreign leader at the summit about the furious health care debate. "He says, 'Barack, explain to me this health care debate. We don't understand it. You're trying to make sure everybody has health care and they're putting a Hitler mustache on you. That doesn't make sense to me, explain that to me,'" Obama said, referring to the antagonistic rhetoric and imagery disseminated about the president by opponents of health care reform. As for the economy, Obama said many people have forgotten how bad things were when he took office and said the administration was making efforts to improve things, such as saving jobs. Obama also focused on the sacrifices made by African-Americans. But he dwelled on what he regards as the major issue of education and cited the disturbing trend of high school dropout rates. He said government can help improve education, mentioning grant and aid programs, rewarding successful teachers and penalizing those who aren't, and rebuilding a crumbling school. But he said "government alone cannot get our children to the promised land," and parents need to do the tough legwork in helping their children achieve. "No excuses for mediocrity," he said. "If they come home with a 'B,' don't tell them that's great -- I know some of you do that -- tell them to work harder and get an 'A.' "